At the same time, the conception of Money, has progressed from the naturally useful function of precious metal towards the realm of pure conceptual unit of account. Seventy years later, the championing of Concept - in art by those who have no conceptual training whatsoever - and in Money by those who have no practical training in use - has coalesced into an unintentional Theater of the Absurd wherein "Fine Art" is dominated by advertising executives and commodity traders, while Money is conjured into existence by academic theorists. But we are clearly in the endgame of the Conceptual Absurdity, and the pendulum is swinging back towards ideals of "use, function and beauty." Plain Edge=> All medals before March 30th 1832 have plain edges and before 1841 for bronze or copper. Antique Lamp=> from March 30th 1832 until October 21st 1841 (on gold & silver only). Anchor=> from October 21st 1841 until September 25th 1842. Ship Prow=> from September 26th 1842 until June 12th 1845. Pointing Hand=> from June 13th 1845 until October 1st 1860. Bee=> from November 1st 1860 until December 31st 1879. Cornucopia (Horn of Plenty) => from 1880 until now. (20.43 gms) Special Achievement Award, signed by J.F.Domard. Awarded to Eugène Scribe by the Commission des Auteurs Dramatiques. Crossed sword, quills and mirror on a lyre decorated with a buste de buffon, engraved scribe 1839-1842, rev. legend in wreath. the 19th century. He operated much as a modern Studio, employing assistant writers to craft pieces from set plots and stock characters. As well as creating hundreds of plays, Scribe himself wrote the libretti for many of the Grand Operas produced at the Paris Opera, collaborating with Verdi, Donizetti, Rossini and others. UNIQUE and of great historical interest. Jules Clement Chaplain. In 1877 he was named the official medallist of the French government; in 1878 he was named a chevalier of the Legion of Honor; and in 1881 was given the seat at the Académie des Beaux Arts. He was responsible for the official portraits of every president of the French Republic from Edme Patrice MacMahon in 1877 to Émile Loubet in 1899. 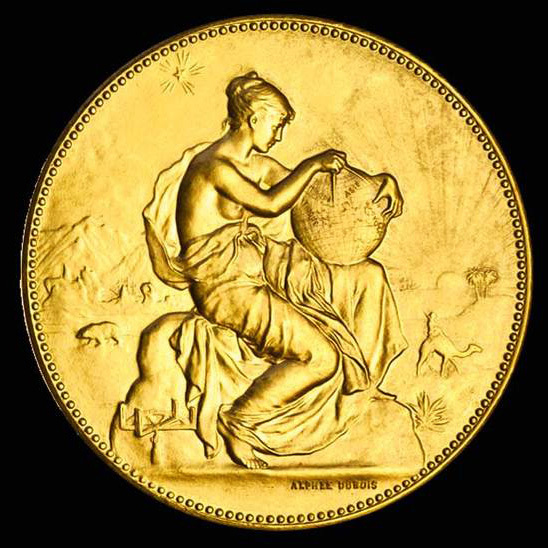 He was commissioned to engrave the gold coinage of France; his gold medal commemorating the visit of Czar Nicholas and Czarina Alexandra of Russia to Paris in 1896 was thought to be one of the finest ever struck. And in 1896 he designed the medals for the first modern olympics. The Universal Exposition, Paris, Gold Medal, 1878, signed by J C Chaplain, both sides. 50mm, (82.63g. .916 fine gold) Laureate head of Marianne left, rev Victory and child genius hover above the exhibition, named in plaque: New York Consolidated Card Co. 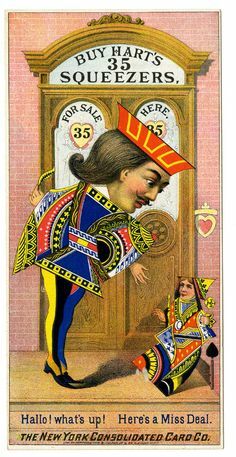 The company produced wonderful playing cards and was founded in 1871 by the merging of three earlier firms which had flourished during the mid-19th century. Very Rare in gold, and in the origianl box of issue - remarkable condition for a medal of this size and age. The Royal Society of Arts (Great Britain) published (in 1879) a comphensive review of the Artists and Artisans to show work in 35 catagories of industrial and fine arts. That number is perhaps indicative of the number of large gold first place medals struck. 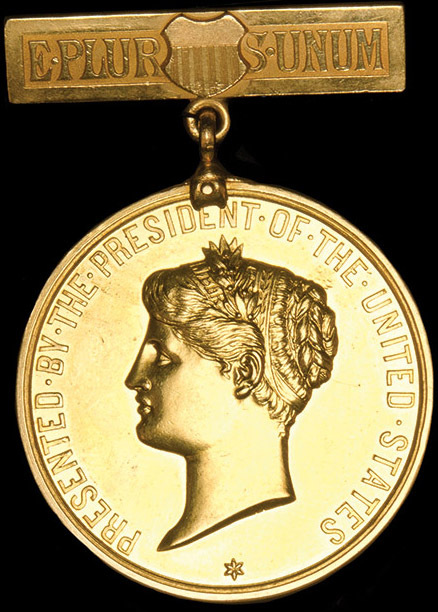 This medal design was used only at exposition of 1878. Lloyd Rouennais, founded 1726, is a French society for the protection of both industrial and commercial marine vessels. 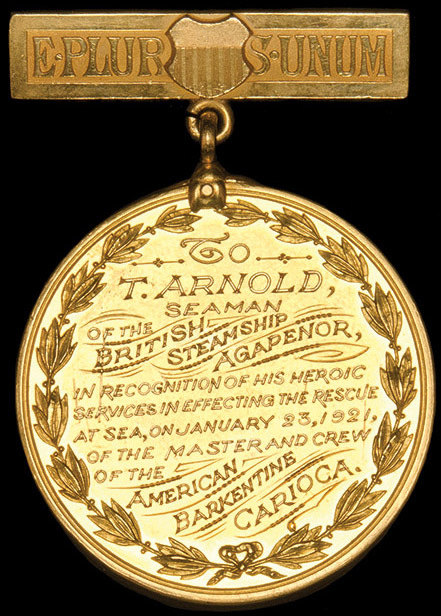 It is the equivalent of the British Lloyd's Group, with the medals issued for similar actions of Bravery and Gallantry at Sea. Extremely rare. 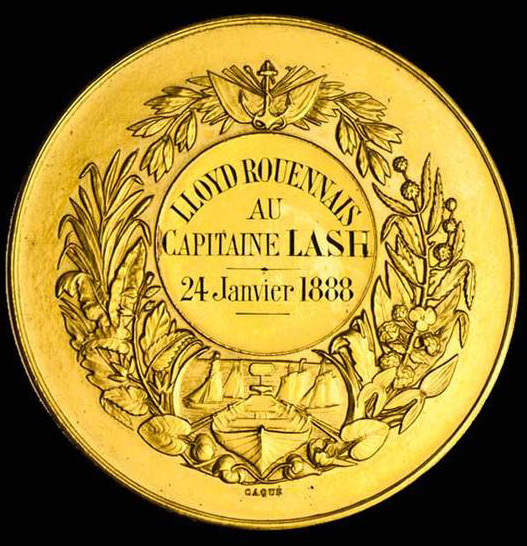 Only one gold medal has been issued by Lloyd's of London, according to the record of bravery awards at the Guildhall library and this is the only recorded example of this gold medal from Lloyd's of Rouen. The reason for the extraordinary gold issue of medals usually issued in silver and bronze is unclear. La ville de Bruxelles AV médaille (38,63g).Dim: 41 mm, par J.C. Chaplain. à Joseph Dupont, directeur des concerts populaires. Droit : Saint Michel terrassant le démon. Revers : Inscription en huit lignes.Extrêmement Rare. Joseph Dupont (1838-1899) obtint le prix de Rome de composition en 1863, puis devint chef d'orchestre à l'Opéra de Varsovie en 1867 et au Théâtre Impérial de Moscou en 1871. Il revint ensuite en Belgique pour diriger l'orchestre du Théâtre de la Monnaie, dont il fut le directeur de 1886 à 1889. 37 mm (28 gm) countermarked 1or on edge. signed by the artist Daniel Dupuis (1849-1899), considered one of the great sculptors and medallists of the period, he was shot to death by his jealous wife at age 50. Obv: Marriane seated with wreaths and child with bugle and book Rev: Prix du Conseil General. Very rare in gold. Gold Plaque for Chilean Independence. Struck in FRANCE. 42x58mm (91.26 grams,18-Karat), by Rene Lalique. Obverse: Female personification of the Republic, standing ‘midst wheat. Reverse: Landscape, divided diagonally by the staff of the national flag; arms below; the Andes in the distance. 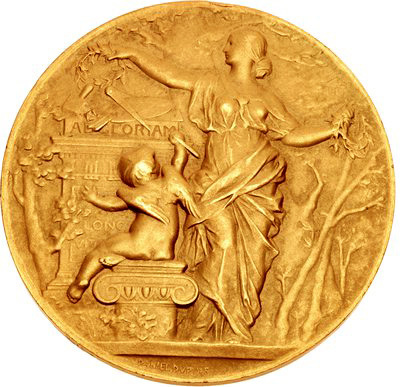 The company Lalique’s continuing output of crystal and jewelry is so well known, the medals by the founder Rene Lalique --issued through WW1-- are overshadowed. A crystal Brandy Decanter (with brandy) designed by Lalique recently sold for $640,000 US in a Hong Kong auction. All of the medals he designed are quite rare. The design for this Chilean piece is one of the most exceptional among all art medals. It is extremely rare in gold. in the original case of issue. .900 gold - marked "or" on edge. A belle epoque interpretation of the Republique Francaise's Mariane with Ceres. 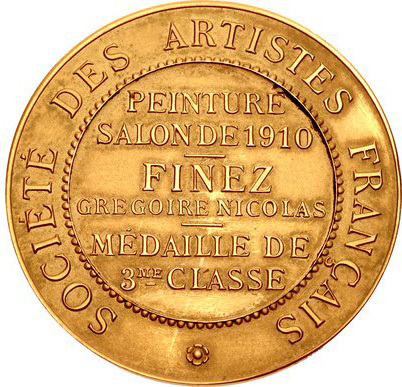 Gold Award medal, 27mm (12.8gm) .916 fine gold. Signed by the Russian emigree artist Felix Rasumny. Here we see a Russian social realist tableau rendered in Art Nouveau style: with Ceres guiding a field worker with rolled up sleaves and a scythe. 28mm (12.8 gm) Edge marked 3 Or. Signed by the artist Oscar Roty. Societe Secours Mutuels (society for mutual aid). Ministere du Travail et de la prevoyance sociale. Awarded to Docter Beaufils and Marie Clamecy. With gold mount and original ribbon. 29mm (12.7 gm) .920 fine gold. Edge marked 1OR Signed by the artist Charles Pillet, (a star pupil of Chaplain) and the series editor A Desaide. Agricultural award. Male and female gardeners tending their chrysanthemums. Very rare in gold. signed by the Russian emigree artist Felix Rasumny. Obv: Gerneral Joffre supreme commander of the French Army in World War I Rev: Allons Enfants de la Patrie: beautifully styled winged Marrianne with sword and flag. With bezel attached. for Maurice Ansiaux, Professor of Political Economy at the University of Brussels, who wrote extensively - and presciently - about the use of Precious metals in the curbing of inflation and the prevention of Economic Crisis. Obv: St Michael, standing over slain devil. Extremely Rare. N.D. Circa 1920-1930 - signed by the artist Alexander Morlon. In original case of issue. Superb Art Deco style. Very Rare in gold. Gold Essai 10 Centesimos. (18.33g) 1930. Reeded edge. Centenary of independence. Obv: Head of Ceres right. (from the 1929 french 100 franc essai) Rev: puma walking left. Very Rare: 60 pieces struck. (KM-E10). 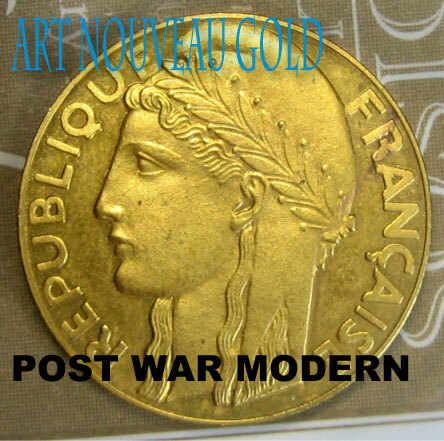 Signed by the French artist Alexandre Morlon Provenance: Karl F Chirico Jr.
FRANCE Fourth Republic Gold module of 20 francs. Monnaie de Paris, Piefort 5 francs, (38 gm. .920 fine gold) From dies of the 1897 essai by Oscar Roty. Signed by the artist on the obverse. Rare year. From a mintage of 35 coins. OBV: Famous Sower Lady (La Semeuse) image.